The General Store is a Gas station/ Convienence Store that offers a one stop shop atmosphere. 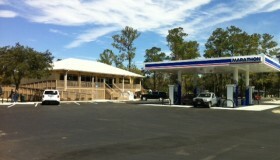 The Gas station offers all types of fuel , Marine fuel, deisel, and automobile gas. Convenience Store offer a state of the art deli, bait and tackle and anything you may need while camping at the RV resort, a day on the water or a day at the beach!